Virtual Reality hit the mainstream recently with the arrival of affordable, consumer-friendly headsets. Already businesses are keenly embracing the opportunities created by this amazing technology. That isn’t surprising, given the possibilities it creates for freeing our minds from the physical shackles of our body and allowing us to “see” into places that only exist in the digital world. In the digital world, the rules are different – objects can be conjured into being by simply describing them. Travelling between destinations takes place in the blink of an eye. And any damage that you do can be undone with the press of a button. All this makes virtual reality – and its sister tech augmented reality, which I will be covering in a separate post soon – a powerful tool for business. So here is an overview of some fascinating ways it is already being used and some glimpses of what could be achieved in the future. Much of the hype around the release of mainstream VR headsets last year focused on their potential for enhancing entertainment experiences. 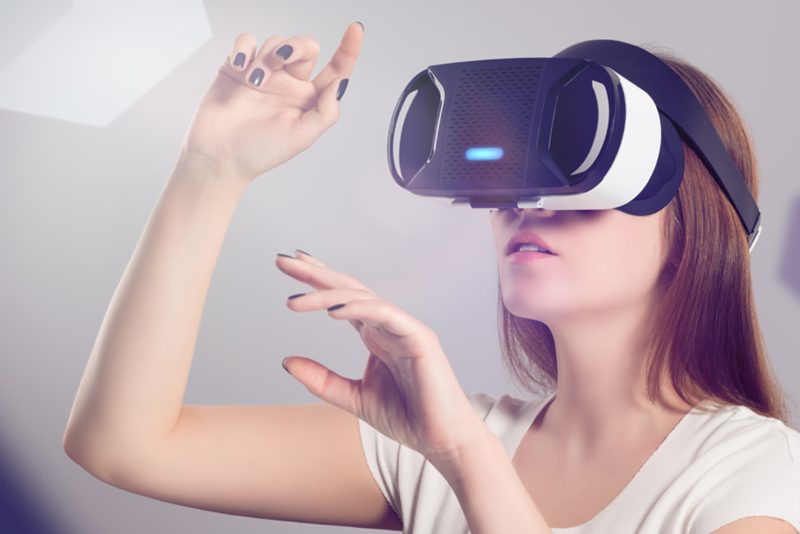 Uptake of VR in business, however, is forecast to outpace leisure use of the technology in coming years, with spending reaching 9.2bn by 2021 according to research fromTractica. Just about any process that can be carried out in the physical world – and in business that would range from customer services to marketing, finance, HR and production – can be simulated in VR. In general, tasks that it can carry out can be split into one of two categories– training, or practical application. For training purposes, VR offers the potential to immerse ourselves in any situation that can be simulated on a computer. Increasingly photorealistic visuals “trick” our brain into believing, to varying extents, that what we are seeing is real, allowing us to monitor, and learn from, our interactions. A great example is the public speaking training systems which have been devised using the tech, such as Oculus’sVirtualSpeech. As for practical applications, they are virtually unlimited – key factors here are the potential for enabling humans to carry out tasks without being present (telepresence) and the possibilities for modeling and interacting with simulations of real-world objects that wouldn’t be feasible in real life. Millions can be saved by eliminating the need to build full-scale working prototypes, by carrying out initial exploration of ideas in VR. Today this is used in aircraft design, with Boeing and Airbus both extensively using simulated digital spaces to design and test new features and models. Architects have already been converted to the technology, as it allows them to present finished concepts to clients, and allow them to freely explore their designs before a single stone has been set in place. VR offers every business the chance to rethink how they present to and engage with, their customers. As both marketing and customer service tools, VR opens new possibilities for showcasing products and services. Further down the line, it is likely to become a uniquely useful source of information on customer behaviour. This is because when someone is engaging with you in a virtual, digital world, a huge amount of data becomes available on how they act, react and interact. Rather than visit a physical showroom, customers leading increasingly digital lives will simply put on a headset and appear in a virtual one. Once there, they can interact with sales assistants – which could be virtual representations of real humans, or, more likely as time progresses, AI constructs operating independently of direct human control. If a customer wants to try out your new car, furniture or kitchen utensil, VR will let them do it without leaving their homes. Of course, real-world showrooms are likely to remain a part of the marketing landscape for some time, as for many products there will be a point where consumers want to see and feel the physical product. But for early-stage market research and quickly getting an overview of a brand’s product range, VR will increasingly offer a convenient alternative. Swedish furniture giant Ikea already offers virtual showrooms and many more retailers are likely to follow. The most apparent advantage of training in VR is that when things go wrong you simply have to hit the reset switch. This already has applications in healthcare, where surgeons are using it to train in making life-or-death choices while carrying out complex operations on children. This simulation goes as far as scanning and creating 3D representations of the real nurses the trainees will work with so they will see familiar faces when they get into the actual-reality operating theatre. Other medical uses allow doctors and surgeons to try out new tools and procedures in a safe simulated environment. Equipment manufacturers also gain invaluable feedback thanks to the close monitoring that VR enables. Pilots have relied on sophisticated simulators for decades. But the million-dollar-plus, room-sized simulation suites are starting to be replaced by more cost-efficient and portable VR solutions. Improved access to state-of-the-art simulators means that, on earning their wings, pilots will take to the skies with far more simulated hours of flying time under their belts. Teachers now have the opportunity to test their mettle against a class of unruly kids in a virtual classroom. As well as rehearsing their teaching methods they train to look out for disruptive behaviour such as students using their phones during lessons. Law enforcement officers in New Jersey, US are using a system which allows them to train for scenarios ranging from routine traffic stops to being shot at. The company behind this solution has gone as far as incorporating technology to deliver an electric shock to trainees if they make a dangerous mistake – with the aim of simulating fear which officers would naturally feel in the field. Although apparently this feature has not been activated in routine training yet. Although compared to traditional, room-based simulations, VR represents a dramatic cut in costs, there can still be significant up-front expenses. This is particularly true if your training needs require bespoke simulations to be coded, and environments designed from scratch. To meet this need we are starting to see the emergence of businesses providing ready-made services, from hireable VR suites to world-building tools. Marketing agencies which have prepared themselves to create virtual and interactive experiences for companies and brands also fall into this category and are likely to play an increasingly prominent role in the marketing landscape of the near future. The emergence of services like these are already playing an enabling role in the development and deployment of VR across industry and leisure, with VR dating agencies, therapeutic services and entertainment offerings all looking to shake up their respective sectors. VR technology is certain to continue to improve, bringing our experiences in virtual worlds more closely into alignment with those in the real one. Recent breakthroughs which could have a widespread impact include the emergence of eyeball-tracking technology, allowing us to interact and activate aspects of a simulation merely by looking at them. Further ahead, experiments are already being done with interfacing brainwave activity, potentially allowing us to alter our environment merely by thinking. Other advances are likely to mitigate against some of VR’s current limiting factors, such as the fact current applications can sometimes feel like somewhat solitary experiences. Current high-end VR devices still generally require expensive, dedicated computers to power them, but this is likely to change as standalone headsets become more capable. Thanks to all of this, it’s likely that increasingly large amounts of our business lives will be conducted in virtual reality as time goes on.